Trying to get the best of both worlds seems to be an eternal struggle in automotive circles. Whether it's a sports car with practicality, a family car that doesn't look like you gave up on your dreams or a pickup that's as useful in the city as it is out on the range, people want a vehicle that can do everything. Of course, no vehicle can actually achieve this, but the 2009 Nissan Frontier comes pretty close for a midsize pickup. The 2009 Nissan Frontier King Cab is powered by a base 2.5-liter Inline-4 with 152 hp. Also available is a 4.0-liter V6 with 261 hp. 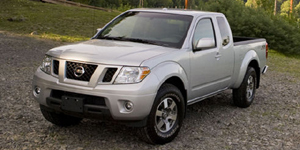 The 2009 Nissan Frontier Crew Cab is powered by a 4.0-liter V6 with 261 hp. Find the used Nissan Frontier of your choice from a dealer in your area. Search our used car listings now.